In the summer of 2013, a major semiconductor chipmaker needed someone to haul away its sulfuric acid co-product, a combination of sulfuric acid and hydrogen peroxide (also commercially known as Piranha solution). This material is a highly corrosive liquid and only certain types of trailers are properly equipped to move it safely. 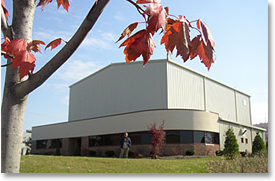 To do the job, our chipmaker reached out to Eldredge Inc, a major transportation and logistics company serving customers throughout the continental US. 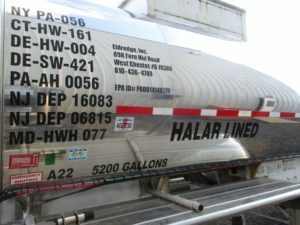 They contacted Eldredge because Eldredge had experience working with a resin liner, Halar®, that the semiconductor company required its hauler to have as the lining of its tanker. The manufacturer requested Halar® to ensure the tanker could safely haul the sulfuric acid co-product. Eldredge agreed to the specification and turned to Electro Chemical, a premier manufacturer and installer of fluoropolymer linings, including Halar®, to outfit the trailer needed to safely complete the job. Not only the liner material, but how it was installed and welded, would all be crucial to the tanker’s performance and service longevity. Eldredge knew of Electro Chemical’s expertise working with Halar® and that their skills with hot-welding fluoropolymer sheets would be needed to install a secure liner that would protect the tanker’s steel shell. With a lining company in place, Eldredge put its engineering ingenuity in action. They had a few additional challenges to solve. First, they knew they’d be loading a 90 degree F mixture of sulfuric acid and hydrogen peroxide, sometimes called “Piranha Etch,” into an ambient temperature trailer. And the temperature in winter in the northern Mid-Atlantic region can get near zero. You can imagine the stress of introducing hot sulfuric acid material at 90 degree F or more into a 0-degree container! To deal with this challenge, Eldredge designed and installed a specialized spray dispersal system. 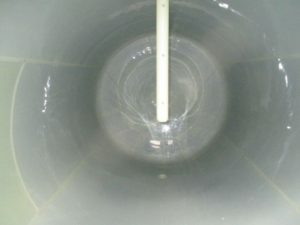 Instead of the material coming into the tank in a single large stream, it passed through a special valve system with a dispersal plate, creating a spray of droplets, which dissipated the heat effectively. Eldredge also deployed its advanced Depth Ray™ system, Liquid Level Monitoring and Control Systems, to gauge how much material had been loaded into the tank. Using the radar readout, they get a more accurate measure of the volume of co-product transferred. The Eldredge team opted to use a straight-barrel tanker for this application, which reinforced their decision to partner with Electro Chemical to do the lining work. Once the trailer was completely inspected and outfitted with everything needed to safely haul the sulfuric acid, the trailer went right into service. And that’s where it’s stayed for going on to 4 years now. For the first year, Eldredge opted to inspect the liner every 3 months. They wanted to be sure that it held up to the corrosive activity of the sulfuric acid co-product. At every inspection, the liner looked great. So they went to yearly inspections in years 2 and 3. And now, as the tanker closes its 4th year of service, the Halar® liner looks like it was installed yesterday! There have been absolutely no maintenance issues with the liner. The trailer is out of service only a couple of days a year for annual inspections. An outstanding testimony to the design work by Eldredge and the lining installation expertise of Electro Chemical. Due to the success of its first tanker, Eldredge has been able to develop a client base for hauling sulfuric acid co-products and now has 6 lined trailers hauling acid. Business continues to grow and Eldredge will likely add additional trucks to its fleet.